The School of English aims to produce literature, language- and theatre-based research that benefits society across a wide range of different sectors. This currently includes work with disadvantaged communities (e.g. refugees), local publishers and museums, and regional, national and international organizations promoting female empowerment, widening educational participation, and environmental health. Dr Julia Snell is currently working with schools and teacher educators to improve the use of dialogic pedagogy in teaching practice. In dialogic pedagogy, teachers and pupils think through a topic together by engaging in exploratory and mutually respectful discussion. Snell and her research partner, Dr Adam Lefstein (Ben-Gurion University of the Negev) previously explored the potential and problems of dialogic teaching in their book, Better than Best Practice: Developing Teaching and Learning through Dialogue (Routledge, 2013). The book, given from 2014 to 2016 to teacher mentors from 86 primary schools as part of a training programme to improve the quality of classroom talk, led to pupils making between one and two months’ extra progress in English, maths and science. Snell and Lefstein’s research has since been adopted by the video-based learning platform for teachers IRIS Connect, with IRIS Connect’s popular e-module ‘Film Club’ having been used by over 16,000 teachers to date. Dr Christiana Gregoriou has led a team of researchers from the Universities of Leeds, Gloucestershire, Hull and Novi Sad to investigate how human trafficking is represented in news media, true crime and fiction. The team found that stories and reports of human trafficking are often stereotyped and overly simplistic. On the basis of its research, the team issued a policy brief detailing its findings and making key recommendations for a wider audience. It also produced an open-access book, Representations of Human Trafficking: Present-day News Media, True Crime, and Fiction (Palgrave, 2018), which has since been used in the NGO Freedom United’s campaign for accurate reporting on modern slavery. 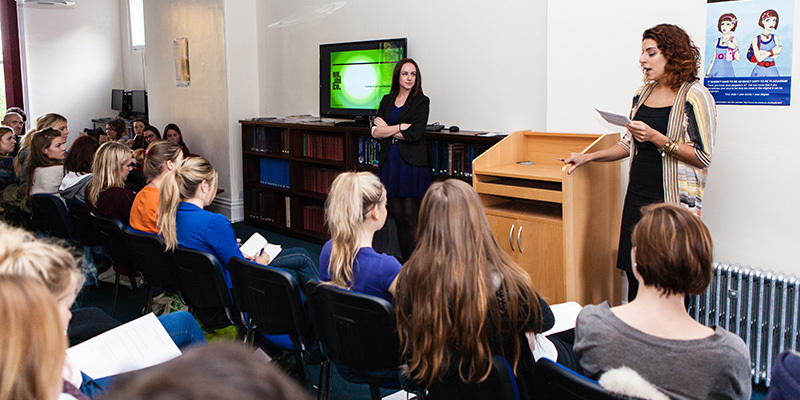 Members of the School of English are also involved in numerous outreach projects. For example, in the award-winning project ‘Writing Back: Using Intergenerational Letter Writing to Shed New Light on Loneliness’, Dr Georgina Binnie has helped match Leeds students as pen pals with older people in Yorkshire. Initiated in 2014, the project continues to enjoy great success among students and older adults alike, and has been profiled in The Yorkshire Post and, more recently, on BBC One’s Look North programme.